Kelly Goff, a Curaçaoan-American artist, spoke to students about his artistic representation of the contrast between human industry and nature on Monday. Much of Goff’s work expands upon preexisting objects, which Goff has termed, “completing their demise.” His work not only highlights the human thumbprint on nature but also explores the effects that humans and nature have had on each other, delving into topics such as environmentalism, resources and distance. 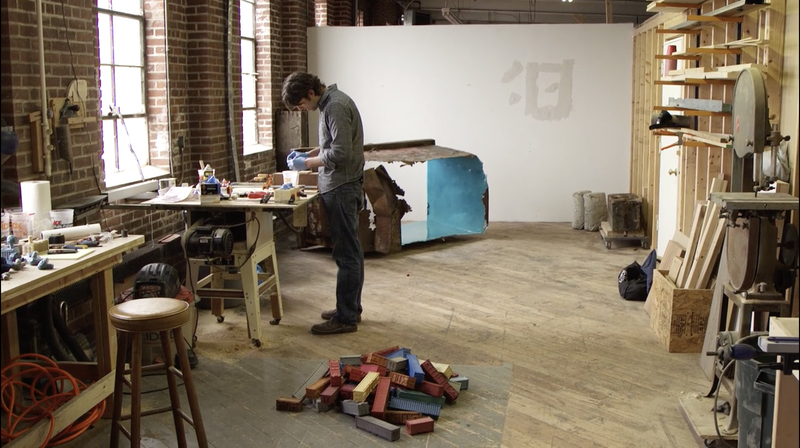 His work, “Dumpster,” is his completion of a deteriorated dumpster he came along on the street. Goff coated the inside of this dumpster with a soothing blue-green palette, creating a “spa vacation” within a rusty hunk of metal. Goff elaborated on the biographical nature of the work, representing the duality of the Caribbean island where he was raised, a place of beaches and industrial oil refineries. Goff creates a more accurate representation of the Caribbean in light of what is often shown in the media, which is a false message of happiness. “‘You’re supposed to be happy, it’s the Caribbean’…[but] that’s not the real reality of any spot in the world,” Goff said. Similarly, his work, “Two Views,” is largely biographical. On either side of a thin white wall is footage of the waterfront from the northernmost part of Curacao and the southernmost tip of America. Goff said this was representative of “two halves of my story.” When this work was completed, he had spent 18 years of his life in Curacao and 18 years in America. Along with drawing on his personal experiences, Goff uses the physicality of nature as inspiration for his art. “More and more my work is informed by the places I go,” Goff said. Goff’s work “Crates” is a series of shipping boxes made from timber he found while traveling through Alaska. These types of boxes are constantly being shipped by the US Postal Service to their various exhibitions, collecting stamps and marks along the way. Goff emphasized the resources these empty boxes use during their shipping process, asking viewers to consider the implications of this. “Souvenir 1” is a bronze-casted replica of a 14-foot square patch of ground Goff discovered while hiking the Himalayas in Bhutan. Goff became so fascinated with this “alien landscape” that he went back to the area a second time to take photos so that he could later scan the data and form a detailed mold of the rocky landscape. “This way of working, if anybody is interested in working this way, is quite slow,” Goff joked on the topic of his artistic process. Much of the Goff’s work on a piece is an intangible component of the physical art. Learning, traveling and deliberating the meaning and manifesting a physical representation of what Goff wants to express takes up the majority of his time. At the forefront of Goff’s consideration when approaching potential projects are the ideas of resources, labor and density. He challenges people to consider how so many hours of labor and resources have culminated into small-scale pieces of art. Antipodes are coordinates on Earth that are the exact opposite of each other. Most continental antipodes are oceanic, however, Goff wants to play with the few antipodes in North America that have continental counterparts. It led to a unique perspective into his way of approaching documentation and meaning behind his work. Goff’s work “Beacon” is on display near the Markle Parking Lot, which is ideally viewed at night.